Coal may be one of the most despised industries on Wall Street, but these two undervalued high-yield coal stocks have three factors that are likely to make them long-term market beaters. Coal prices have been hammered in recent years by a combination of falling power plant market share due to cheaper alternatives such as natural gas, and increasing U.S. regulatory scrutiny by the EPA. Meanwhile, export demand has been hit by both slowing economic growth in China and that nation's new coal import restrictions. 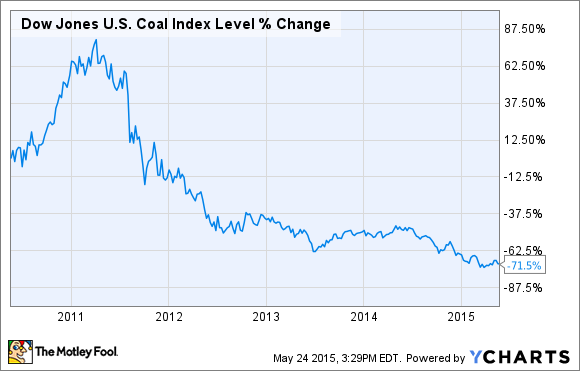 Overall, it's not hard to see why coal stocks have been one of the worst performing sectors in the past five years. While coal as an industry is likely to continue to struggle in the long-term there are three reasons that I think Alliance Resource Partners LP (NASDAQ:ARLP), and its general partner Alliance Holdings GP (NASDAQ:AHGP), are by far the two best stock to invest in coal and could still make potentially excellent long-term income investments: incredibly low production costs, sustainable and growing dividends, and low debt levels that help them grow their business while protecting their generous payouts. Alliance Resources is a leading low-cost coal producer thanks to mine locations that are closer to their end users -- mostly coal fired power plants -- Alliance has lower transportation costs and is able to obtain better pricing than its competitors that operate in the higher cost central Appalachian region. As for the Powder River basin, America's largest source of coal, its location in Wyoming and Montana means that Alliance's competitive advantage of being located closer to end users is even stronger, which is partially why Illinois basin coal has been stealing market share from Powder River basin coal in recent years. This trend is expected to become even stronger now that cheap SO2 scrubbers allow coal power plants located in the east to utilize high-sulfur Illinois basin coal while complying with the Clean Air Act. Another critical competitive advantage is that Alliance, as a newer coal producer, it has less legacy costs, due to its lack of union labor. Legacy costs, such as expensive pension obligations have hit competitors hard and -- in the face of falling coal prices -- helped force some producers, such as Patriot Coal, into bankruptcy. Alliance's ability to produce coal at extremely low costs has allowed it to remain competitive with natural gas which has averaged around $3.5 per mmBTU over the past five years as well as allowing it to capture more coal market share from its rivals. Source: Alliance Resource Partners investor presentation. These two factors have combined to result in 14 consecutive years of record production, revenue, and EBITDA growth. However, past performance isn't enough to build an investment thesis around but luckily for Alliance there is cause for optimism regarding its future ability to continue growing sales, cash flows, and its payouts. I won't lie to you, the coal industry is in trouble with the EPA's recent rule proposals threatening to put the fuel source into permanent secular decline. In fact the Energy Information Administration just released a report analyzing the effects of the new regulations on the industry and concluded that it would likely reduce coal power generation by 18% to 43% by 2030. However just because coal's share of the future energy mix is likely to keep shrinking doesn't mean that Alliance can't keep growing by capturing market share from flailing competitors. Such market share gains are actually likely because key coal mines around Pittsburgh and in the Illinois basin are expected to run out of reserves and shut down in the coming years. Alliance is actively investing in new mines and it currently has around 5 million tons of spare capacity, allowing it to step up and replace falling supply from the competition. In addition, Alliance has already planned for stricter environmental regulations and the company estimates that by 2020, 57 GW of coal fired power plants on the east coast will be taken off line. However, the remaining 181 GW of capacity still provide Alliance with ample room to grow via market share expansion and should allow its payouts to remain sustainable and grow at a modest pace. Most coal producers are burdened by high debt levels, which make it much harder to service debt when coal prices are low. Alliance is in the enviable position of having extremely manageable leverage ratios that grants it incredible flexibility and the ability to keep growing despite industry distress, through acquisitions of additional low-cost coal reserves at fire sale prices. Coal may be an industry in decline but that doesn't mean that long-term investors can't still earn market beating total returns from it. Because of their generous, extremely well supported, and growing payouts backed by a strong competitive advantage of some of the lowest production costs in the industry, Alliance Resource Partners and Alliance Holdings GP represent the two best coal stocks in America, and in my opinion, deserve a spot on income investors watch lists.